Two admin screens support player data entry: (All) Players and Add/Add Player. Each screen is described below. The Players screen provides a list of all players as shown below. You can filter the list by team, just like you might filter regular posts by category or tag. You can also sort the list by name (title), first name, last name, or number. To edit a player, roll over the player’s name and either click the name or click on Edit in the contextual menu that will pop up. The Add/Edit Player screen is used to enter player data. The fields are generally self-explanatory, and help is provided for ‘standard’ field usage. Notes on some data fields and the meta boxes in the right hand column are provided below the screen shot. ALL FIELDS. Remember you can re-purpose any data field by changing the column heading and data entries for that field. If for example you choose to display Weight then Height instead of the default Height then Weight, you would enter the Weight in the Height field and the Height in the Weight field and change the column/data field labels accordingly on the Settings screen. TITLE. The title is the large box at the top of the screen. This field appears on the back-end only; it appears nowhere on the front end. It can be used in several ways to help manage large numbers of players on a site, but I suggest you simply enter the player first and last name, then drive on. It appears in the all players table as the “Name” column. PLAYER BIO. The player bio (aka the post content) accepts most mark-up language constructs. You can see some simple mark-up in the screenshot above, but you can also add hyperlinks, images, and so forth. The Text tab lets you “he man” in all the markup. The Visual link does a lot of the formatting work for you, but is more restrictive. Be creative! MSTW TEAMS. 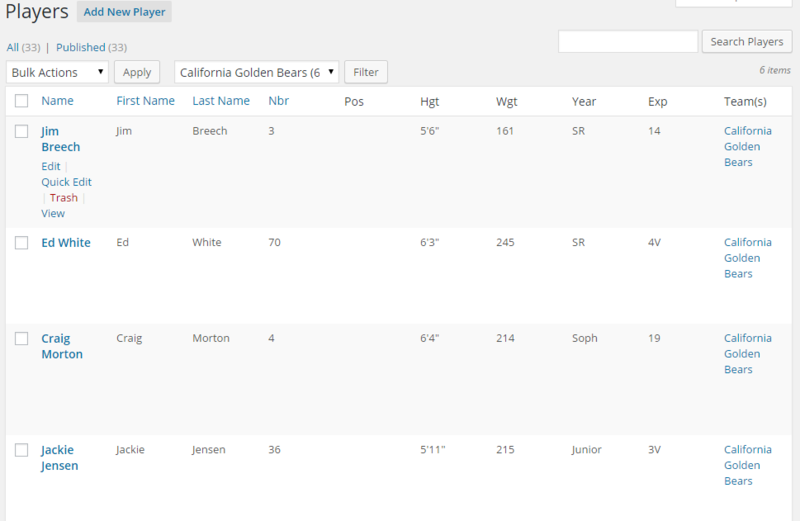 Use this metabox to assign a player to one or more teams. The team must be entered in the Teams admin screen before it can be assigned to a player, so maybe you want to add your teams before adding your players. You may select a team from the ‘Choose from most used teams’ link, or you can begin typing a team name and it will autofill from the Teams list. A player does not have to be assigned to a team, but he/she will not appear on the front end until assigned. PLAYER PHOTO. Use this metabox to add a player photo. 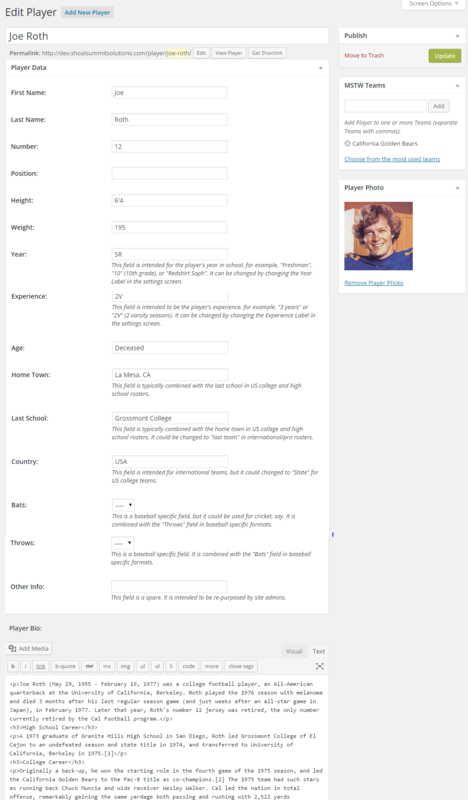 Player photos must exist in the Media Library, but they can be uploaded to that library using the Set Player Photo link.